I posted another question for our Face Book friends. This is a group of about 350 adults who have had a tonsillectomy within the past five years. It’s an amazing community of supportive and thoughtful adults without tonsils. I wanted to assemble a collection of tips for new patients who are planning tonsillectomy surgery- particularly adults since they have a more difficult recovery, but also because they would typically be the ones doing preparation for themselves or a child. If I could recommend one product to someone preparing for tonsillectomy it would be___________. Mari Re- A snow cone maker-a must!! Dee- Do a lot of good deeds before so when ur praying for relief he will help ya. Seriously. Water is great and a humidifier helped me greatly. Jean – Water, a recliner, and a humidifier. Misty – After pain meds it would be pudding for me. Kate-Several big flexible ice packs–always keep one in the freezer so it’s ready to go whenever you need one. Jean -I would agree with the flexible ice packs! Ice was my life saver! Kiersten -Lol-I thought pain meds and water was a given!!!! Rosie – Jello, peaches, netflix, and hot bathes. Christy-After pain meds, the magic mouthwash, mashed potatoes after you can somewhat eat. Go to an urgent care if you are starting to get dehydrated. I lost 14lbs in 7 days. 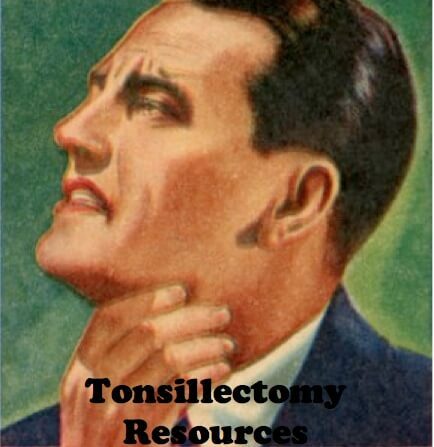 Tonsillectomy Resources Wow! Great stuff. Thanks everybody! Brandi – Pain meds and Sonic ice chips – I think I would have died without both! Chente -Also- Thought I would pass along something re: magic mouthwash just to make others aware so it doesn’t happen to them. At one point after using the wash and I swallowed to pass saliva, my mouth and throat were numb and the saliva just kinda sat in my throat and I couldn’t pass it and then I choked and started coughing really bad. That isn’t what you want to do after a tonsillectomy. So just be careful and swallow with caution! Jina -Humidifier, ice packs, crushed ice with water. Boost drinks in the beginning for energy. Kitty – An alarm to remind the next med and note pad to write down the meds as taken. It was hard to remember in the middle of the night. Both help to keep meds on board and the pain at bay. Rachael – Pain reliever in liquid form.